The Epiphone Limited Edition ES-345 brings back one of the rarest and most revered ES-style designs in three stunning color finishes--Alpine White, Cherry, and ebony along with a gold Bigsby™ tremolo to make a truly high-class instrument that will set you apart on any stage big or small. The ES-345 was first released in 1959 and was quickly embraced by rockers and bluesmen alike for its classy look and incredible range of tones. Fans of the ES-345 include Keith Richards, B.B. King and Freddie King, whose classic “Hideaway” was recorded with an ES-345. The key to the new Epiphone Limited Edition ES-345 is Epiphone’s legendary VariTone™ control, which enables players to invent a wide range of tonal colors and pickup variations with easy recall. Vintage ES-345s are nearly impossible to find today and even harder to find is an original stereo ES-345, but we’ve taken care of that as well. The Epiphone Limited Edition ES-345 features both mono and stereo outputs, making the modern ES-345 the ultimate axe. Like all of Epiphone’s instruments, the Limited Edition ES-345 it also is covered by Epi’s world famous Limited Lifetime Guarantee and Gibson’s one-of-a-kind 24/7/365 customer service. Get the thrill of the ES-345 today! 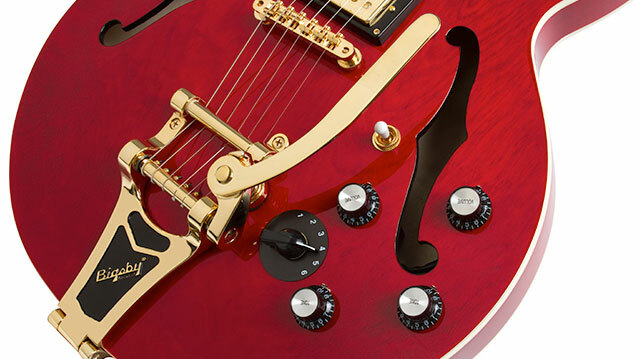 Several Epiphone models are provided with the pickguards purposely left unattached. This is because some customers prefer no pickguard. For those customers that prefer the pickguard attached, this video is intended to assist you with this installation. While the installation process is not difficult, if you do not have the tools, skills or confidence, DO NOT ATTEMPT. Instead, take your guitar to an authorized Epiphone Service Center for installation. If you do choose to install the pickguard that came with your guitar yourself, your warranty will not be voided unless of course you damage your guitar during the installation process. In case of damage, the specific or any related damage will not be covered under the warranty. For further information or if you have any questions or concerns, please contact our Customer Service department HERE. To review our Limited Lifetime Warranty, see HERE. The Limited Edition ES-345 follows the classic ES-style design shape and features a laminated maple body with a single layer of white binding on the body and neck. The 24.75” scale mahogany neck has our classic SlimTaper™ 1960s “D”-profile, a perfect size for both hard rhythm and stinging leads and is hand-set with TiteBond™ glue. The rosewood fingerboard has a 12” radius with a 1.68” nut width for proper string spacing along with pearloid “Parallelograms” inlays. The Clipped Dovewing headstock features a pearloid “Pineapple” design. The pickguard comes unattached but also has white and black binding. The ES-345 is available in Alpine White, Cherry, and ebony. The ES-345’s electronics feature Epiphone’s famous Alnico Classic™ Humbuckers in the neck and bridge positions and like the original, all basic tone variations are accomplished with vintage style Black Tophat volume and tone knobs with metal inserts and pointers. But the ES-345’s original power really begins with the VariTone™. 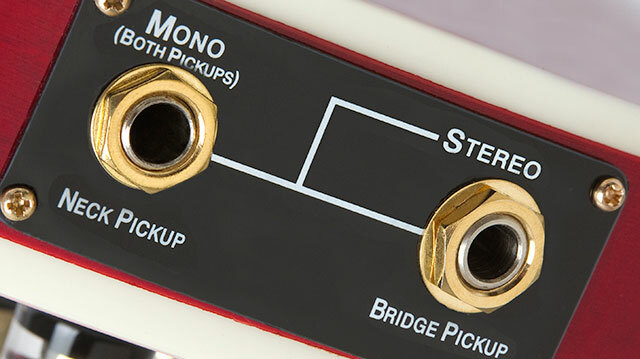 The VariTone™ uses a six-way rotary switch which engages five pre-set notch filters and a bypass. In position 1, the VariTone™ is completely bypassed. As you rotate the rotary switch into positions 2-6, the center frequency of the notch filter shifts from around 1.9kHz down to 130Hz, providing a player with a wide tonal palette unavailable on most other instruments. Positions 2 through 4 offer tonal shaping while still maintaining great clarity. But keep turning and you’ll find Positions 5 and 6 shape-shift the Alnico Classic™ Humbuckers into a single-coil style pickup but without the thin quack usually associated with traditional single coil pickups. Add it all up and between the 6-position VariTone™ circuit and the 3-position toggle switch, you have 18 unique tones available. Epiphone players expect high standards when it comes to hardware. Along with the classic gold Epiphone Locktone™ Tune-o-matic bridge and 3-way all metal toggle switch, the ES-345 has all-metal Mono and Stereo output jacks, a gold Bigsby™ tremolo, gold Wilkinson™ 14:1 vintage styled machine heads with Tulip Buttons and last but not least, a vintage style bell-shaped 2-layer truss rod cover with “Stereo” engraved in white.